After dealing with Blanchard for a couple of Gold/Silver purchases, I have hit a stumbling block. Now that I have some money to invest in Gold/Silver, I wish to use the trustee who has my existing self-directed IRA, whom I have been with for several years and who supervise a non-traditional IRA investment of mine that is worth several times what I am trying to invest in Gold. Blanchard however, is balking at allowing me to use them as my trustee. I have reviewed the process that IRA Services enumerates on their website. Simply, they ask for an investment direction form signed by me, and an invoice from the dealer. They pay the dealer from that. 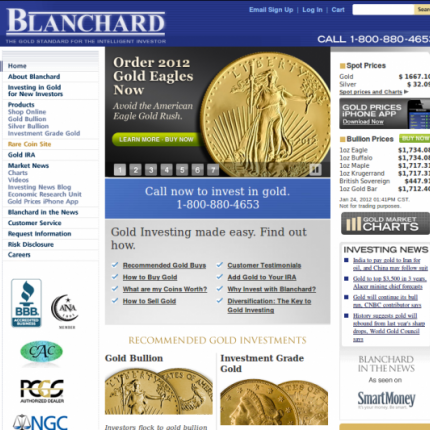 So it looks like the process is not rocket science, especially for a big name like Blanchard. Therefore it makes you wonder why they are so in love with Gold Star (and perhaps one other company whose name escapes me)??? ?